Bally Technologies have created some quite amusing games over the years and Cash Wizard is definitely one of those games. If you want to know more about Cash Wizard slot, its specifics, its bonus features and other important information regarding this game, please read our full Cash Wizard slot review, here we will talk a bit more about the Cash Wizard demo version, and discuss why it is advisable for you to try out this game in demo mode first. 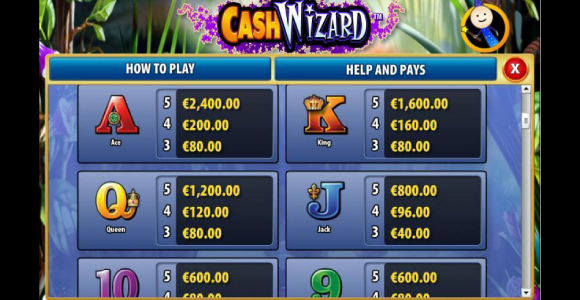 The Cash Wizard demo game will get you familiar with the game, its gameplay, its basic and more advanced features, the options, the potential winnings. Reading our review will give you a theoretical intro to the game, whereas playing Cash Wizard in demo mode will enable you to get a more practical insight into this exquisite Bally slot. The best part about the Cash Wizard demo is that it completely matches the standard real money game, in fact it is completely equal, the only difference is that you are not playing the game with real money. So, you can get everything on the game, learn about it, see how well it works for you, whether it is playable, whether it is rewarding, if it matches your preferences and if it meets your demands, without actually having to risk any real cash. That is the most positive aspect of Cash Wizard demo and of demo versions of slots in general. Once Cash Wizard demo loads, you will notice that you have virtual money at your disposal and you can use them to make wagers on the game. You can adjust your stake and set the reels to spin just like you would if you were playing the game with real money. Even though the cash that is available isn’t real, treat it like it is and try to play like you would if you were playing with your own money. That is the best way to get a taste of the game, to see how everything works and to understand game dynamics before reaching a decision whether the game is worthy of your attention and money. Just bear in mind that the results of your demo session might not be replicated in the real money session. The reason for this is that the game RTP, which for this game is almost 94%, or 93.99% to be more precise only gives the theoretical return rate, it doesn’t mean that it will be the case for every session. When it comes to the likelihood of winning in the demo version versus real money mode, the game is identical and that’s why we say that the demo is an accurate representation of the game. So, the best way to get acquainted with Cash Wizard is by playing the game in demo mode first and then, once you see how everything works, you can sign up for an account with Secret Slots, if you haven’t already, and then play Cash Wizard in real money mode.